* “Clerks II“–Read my review column on this horrid, depraved celluloid monument to the continued decline of American civilization. * “My Super Ex-Girlfriend“–This looks like a chick-flick but isn’t (but for the ending). Guys and women, you will like this one. It’s funny, interesting, and new–even if the ending was a tad chick-flickish and cheesy. “Fatal Attraction” meets mousey “Wonder Woman” is the best way to describe it. Luke Wilson dates a psycho, jealous female super-hero played by Uma Thurman. He dumps the overly-needy woman and suffers “Fatal Attraction” tactics she perpetrates. Except, she has superpowers with which to commit the “Fatal Attraction” feats. Guys, if you ever had a psycho ex-girlfriend from hell, she was nothing compared to G-Girl. More proof that masculinized tough chicks and blurred gender roles aren’t exactly a great thing. * “Lady in the Water“–The latest from very creative science fiction thriller writer/director M. Night Shyamalan is not the horror flick that TV trailers make it appear to be. That said, while not “scary,” the fairy tale thriller is novel, interesting, and very likeable (if at times the plot feels far-fetched and over the top). Charming, with beautiful cinematography. The movie’s leads are coincidentally the progeny of real-life high achievers. The talented Paul Giamatti (son of the late Major League Baseball Commissioner and Yale President A. Bartlett Giamatti) is very convincing as a nervous apartment handyman–a former medical doctor whose life was broken when his family was murdered. 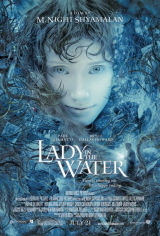 He finds Bryce Dallas Howard (Ron Howard’s daughter), a nymph from another world, in the apartment complex swimming pool and must save her from certain death from monstrous interlopers. Her name is “Story,” referring to the plot that ultimately manifests itself: She is a character in a fairy tale story, and the apartment complex residents are, too. What’s great about this movie is that it is a relaxing, escapist film without a heavy PC message or other Hollywood message, even though the movie deliberately features ethnic “diversity” in its cast and characters. Their portrayals are actually very un-PC and funny. The best is an annoying film critic, who gets his. The slackers–much like the losers you’d find in “Clerks II” minus the depravity–are ridiculed, too. The sub-rosa spiritual/religious feel of the film is appealing to believers, too.